Get the BEST Quote on a 2011 Volkswagen in New Jersey. Need Service? Schedule Appt. here. **Remember... Douglas Volkswagen is always with you..... on your Phone! Schedule Service, Order Parts, see our current Specials, Browse our Inventory or just say Hi! 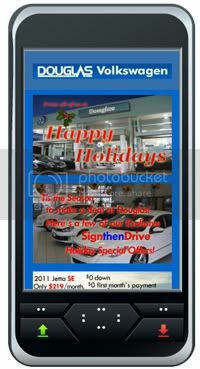 Just type in DouglasVW.com & enjoy our Mobile presence. Now that`s convenience.